Advanced Pipe Trades Math for iPhone And while perhaps obvious, if you change from an iOS device to a non-iOS device, you WILL need to buy a new license as they are incompatible. 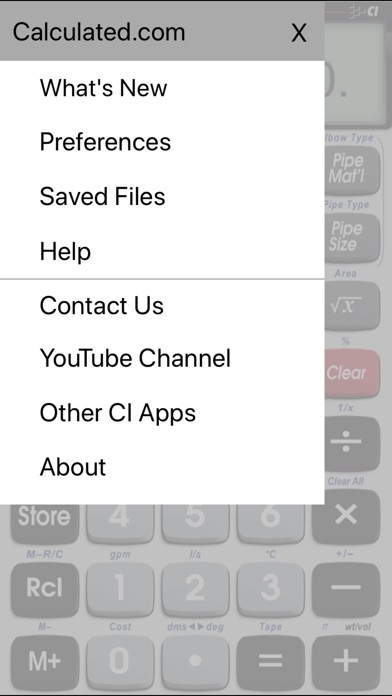 The Pipe Trades Pro for iPhone smartphone gives you instant answers for all your pipe layout and design problems, including complex rolling offsets, parallel pipe cutbacks, weight/volume conversions, flow rates, pressures, areas and more. If you've ever used a smartphone to look up pipe data or do a pipe layout calculation, you'll like this app. With the Pipe Trades Pro you'll spend less time calculating and looking at charts and more time cutting, welding and placing pipe. 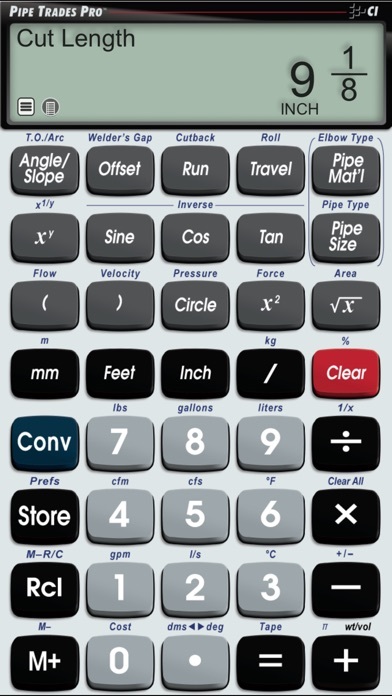 For: Pipefitters, Steamfitters, Sprinklerfitters and Welders Calculations - Cut Lengths, Take-outs and Odd-Degree Fittings - Right Angles, Offsets, and Complex Rolling Offsets - Fitting Angles, Bends, Slopes, Percent Grades, Drops - Parallel Pipe Cutbacks - Feet-Inch-Fractions and Trigonometry - Pipe Areas, Fill Weights - Flow Rates, Velocity, Force, Volumes - Pressure Loss for any Pipe Size, Type or Distance - Complete Building, Plumbing and Metric Unit Conversions Built-in Pipe Data - Choose a Pipe Material and Pipe Type and enter Size up to 42-inches and get Diameters, Wall Thickness, Filled Weight per Foot, Internal Area. - Seven different Pipe Materials: Steel, Stainless Steel, Brass, Aluminum, Cast Iron, Plastic, Copper. This app is not what I thought it would be for plumbing. It's geared towards welders. It's hard to understand and use. Apple will not give you a refund after you purchase it. Buyer beware. This last update caused an issue When adding or subtracting fractions, an error message appears. Please fix. Well I thought this app would be a great tool to have, instead of carting along a separate calculator. It just quits working for no apparent reason and I can't find an update. Also it will only allow you to open it on I tunes not re download the app. It use to work so well now it's like the calculator is dead; the buttons press but nothing shows up. Please fix I purchased this expensive calculator for work!!! As everyone else. Did the update now nothing works at all. Need this app so please fix soon. I had the same problem I deleted the app and downloaded it again seems to be back to normal. Since the update the calculator is dead. None of the functions work. What's the deal!? Edit: Received an email from tech support and all I had to do was delete the app and reinstall it. It's working fine now. What the heck! Use this daily! Well back to pen and paper! Too bad I really liked this app!